On Tuesday February 24th of 2015 the Geneva Summit for Human Rights and Democracy was carried out at the International Conference Center of Geneva with a successful outcome. Throughout the day, different discussion panels took place featuring human rights advocates and victims of human rights violations. Among them we can highlight the participation of Tamara Suju, Venezuelan Human Rights lawyer, Yeon-Mi Park, a 21 year old North Korean defector, Saa, a Nigerian schoolgirl who escaped from Boko Haram, Pierre Torres, a French journalist held hostage by ISIS for 10 months, Ashiq Masih, husband of Asia Bibi who’s currently on death row in Pakistan for blasphemy, María Corina Machado, Venezuelan opposition leader, Alex Chow and Lester Shum, Secretary and Deputy Secretary of Hong Kong Federation of Students, and Juan Francisco Sigler Amaya, Cuban Human Right’s activist; among others. Representatives from the 20 NGO coalition who sponsored the Summit, awarded Raif Badawi (Saudi blogger recently condemned to 1,000 lashes) with the Courage Award and Masih Alinejad (Iranian freelance journalist) with the Women’s Rights Award. 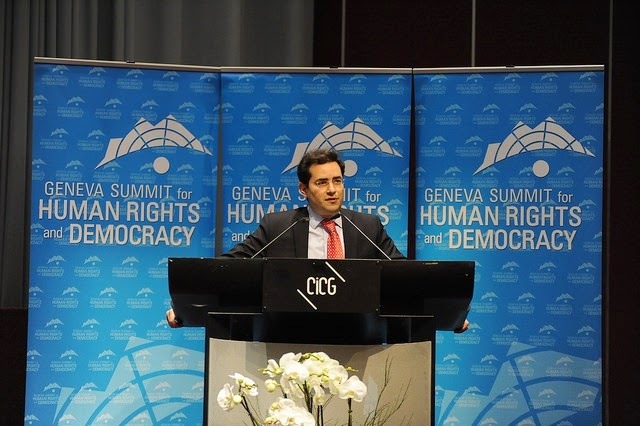 The 2015 Summit ratifies the efforts and convictions of NGO’s, civil society, and Human Rights advocates to join hands in this courageous journey for the access to global democracy and human rights.